Doing business over the Internet may raise a wide array of legal questions that can be crucial to the commercial success of the venture. e-Business Law of the European Union contains the text of the EU legislation which is of particular relevance to e- business, covering a broad spectrum of legal issues such as data protection, distance selling, electronic signatures, liability of online intermediates, electronic money, applicable law and jurisdiction in international disputes. 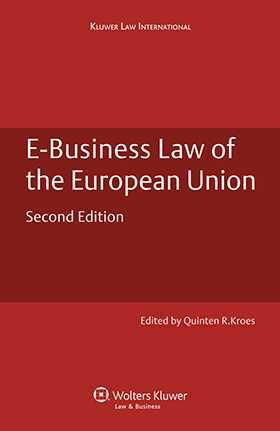 This publication combines the regulatory initiatives of the various directorates-general of the European Commission (which may also be found on their websites) in one convenient hardcopy volume, making it an essential reference book to any lawyer, business-executive or law student dealing with the legal aspects of e-business. The source materials selected for this publication are explained briefly in a short introductory chapter for those readers not already familiar with this exciting and dynamic subject matter. This volume was put together by lawyers from various European offices of Allen & Overy who are part of Allen & Overy's cross-border CMT Group (Communications, Media & Technology). The CMT Group's truly international footprint, integrated approach and vast experience in each of the CMT sectors has made Allen & Overy one of the leading legal names in the field of e-business and ICT.